"There's nothing noble about dying. Not even if you die for honor. Not even if you die the greatest hero the world ever saw. Not even if you're so great your name will never be forgotten and who's that great? The most important thing is your life, little guys. You're worth nothing dead except for speeches. Don't let them kid you any more. Pay no attention when they tap you on the shoulder and say come along we've got to fight for liberty, or whatever their word is. There's always a word." A 1938 novel by Dalton Trumbo that became a rallying point for the political left after World War II. It follows a young man named Joe Bonham, who, after becoming grievously injured during World War I, is left deaf, blind, dumb, and without any limbs. Throughout the book, Joe reminisces about the life he lost, waxes philosophical on war and conscription, and tries desperately to communicate with the doctors keeping him alive. A film version was written and directed by Trumbo himself in 1971, staying fairly close to the source material but with new scenes added (we see more of what's going on around Joe in the hospital, for instance). Metallica later bought the rights to the movie so they could use clips of it for the music video to the song "One" (based on the book). And I Must Scream: Joe in fact tries to scream when he realizes what happened to him, but is unable. Armies Are Evil: A nurse realizes that Joe is banging his head against the headstand in Morse Code. But she doesn't know Morse. So she brings in an officer to translate. When the officer realizes that Joe is asking to be either displayed as a monument to the horrors of war or permitted to die, his response is simply "What you ask is against regulations." Trumbo claims he came up with the idea for Johnny Got His Gun after reading an article about the Prince of Wales's visit to a soldier who had lost all of his limbs and senses in a Canadian veterans' hospital. Trumbo stated this in a New York Times interview shortly after the Johnny Got His Gun movie came out and it's been repeated ad nauseam. But no one ever seems to have looked into it. The Prince of Wales did visit a soldier who lost his limbs in a Canadian veterans hospital, and the same soldier did appear in at least one newspaper article which referenced the meeting. The rest appears to be Trumbo's own invention. The Blank: Joe's entire face is blown off, including his entire mouth. All he is left with is one hole for breathing. Body Horror: Joe is reduced to the minimum necessary to sustain life. Even his limbs have been completely disarticulated, so he doesn't have so much as a stump. Character Filibuster: Joe in the last two chapters. Contemplate Our Navels: Well, that's all he can do. Cruel Twist Ending: The military officer's response to Joe's request to be put on display to show the public what happens to people like him who are unwillingly sent out to die: "What you ask is against regulations. Who are you?" Leads right into the Downer Ending. Deliberately Monochrome: The film alternates between Joe in his war torn state, and flashbacks of his life before the war. The flashbacks are in vibrant color, while the present is in dreary black and white. Downer Ending: Joe resumes going insane, something which was temporarily halted when he learned he could communicate in some way. It is more or less explicitly said that this is how he will live out the rest of his life. Then, to stop him from freaking out the nurses, they drug him with pain-killers. It ends as he slowly sinks into a haze. Everyone Knows Morse: Joe mentions that he learned the Morse code in his childhood when he used it to communicate with a neighbor boy. Fate Worse than Death: Let's say that you're blind and deaf, you can't move because you have no limbs, you can't talk aside from banging your head in Morse code, and you can't even tell if you're dreaming or not. Now imagine having to live this way for what seems to be several years. That's Joe's situation in a nutshell. Filk Song: Metallica's "One ". They even purchased the rights for the movie to use it in the video. The Film of the Book: A film adaptation was made in 1971, written and directed by Trumbo. Gratuitous Latin: A title card before the film's closing credit reads "Dulce et decorum est pro patria mori" which means "It is sweet and proper to die for one's country". Wilfred Owen wrote a rather famous anti-war poem by the same name. Helpful Hallucination: In one of his fantasy sequences, Joe's father reminds him to use the Morse code for communication. Hope Spot: When Joe finally manages to get his anti-war message across to the people. I Cannot Self-Terminate: Joe begs to be killed. In the movie a nurse tries to end his life, but is stopped. Irony: In the film Joe is raised a Christian Scientist, whose belief entails that the material world doesn't exist, including disease and injury. Realizing this will heal you. Joe is seen desperately trying to tell himself "Nothing exists but mind" without success. Literary Allusion Title: The title refers to "Over There ", a 1917 hit song written by George M. Cohan that was popular with United States military and public during both world wars. The Lonely Door: In the film, during Joe's hallucinations he steps out of the bakery door and into a forest scene with the door still standing amidst the trees. Madness Mantra: Just before fading to black, "S.O.S. Help me". Mercy Kill: Joe asks for this, but is denied. The film has a nurse try to do this, but she's stopped. Messianic Archetype: Joe sees himself as this as he continues to think about his unique condition. Mind Screw: Due to his horrendous impairment, Joe can't discern dream and reality. He sees crazy imagery such as Jesus Christ and other strange mish mash between his memories and imagination. The movie expands on those. The novel implies a lot of Joe's Mind Screw is caused by the copious injection of tranquilizers. Monochrome Past: Inverted in the film version. Joe's memories are in color. Sarcastic Title: The title is taken from the opening line of the famous American World War I patriotic song "Over There". Sanity Slippage: Joe is fighting a losing battle to remain sane. The movie shows he completely loses it at the end. Sense Loss Sadness: Joe cries bitterly when he realizes he lost his sight, hearing, limbs and face. Still Fighting The Forty-Five: During one of his reveries, Joe remembers a Scottish soldier who refused to fight against a Bavarian regiment because they were led by Crown Prince Rupert , who held the Jacobite claim to the throne of England. Joe was amazed the soldier's superiors didn't just shoot him for treason; instead, they rotated him to the back of the trenches until the Bavarians themselves were rotated out. Time Dissonance: Telling time becomes an obsession for Joe, who has no idea how much time has passed since his accident, and thanks to his lack of eyesight or even eyes, can hardly tell when he's asleep and when he's awake. He starts to tell time by how often a nurse comes in to change his sheets and then by trying to feel the sun on his body. 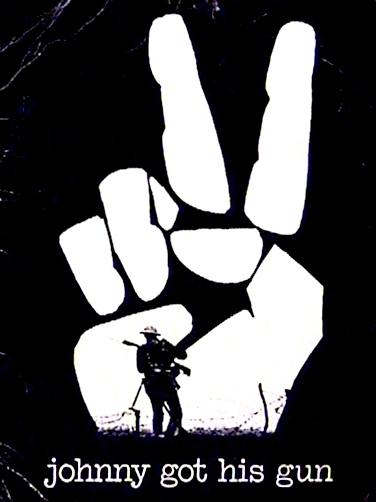 War Is Hell: One of the central messages of the novel and film.